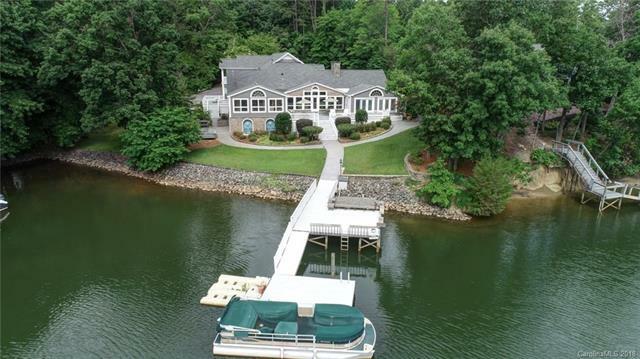 Magnificent lakefront custom home on Lake Wylie! Deep water dock in no-wake zone. Located on perimeter lot River Hills Plantation. No HOA fees but can join club for all amenities including pool, tennis, fitness center. Gated community. Large windows and doors for perfect view on lake and woodland. 12,000 square feet of decking on east and south sides for sunsets. Master on main with his and her bathrooms with a large double shower (10 heads). All floors hard surfaces; hardwoods, tile and stone. Large kitchen w/15 foot island and window wall. Wolf stove and Subzero 5 foot refrigerator. 4 car large garage – double entry. 5,000 square feet of stamped, stained concrete. Wet bars. Upstairs full sized guest house. 8,500 square feet under roof. 2,000 square foot deck. Must see home in person. Ready to move in!